An 'abhorrent' child sexual exploitation campaign by North Yorkshire Police has been removed after receiving huge backlash online, with Twitter users accusing the force of victim blaming. North Yorkshire Police have been slammed for telling children they can avoid sexual exploitation if they make 'the right choice' as part of a new online campaign. Jessica Eaton, the Founder of a support site for victims of sexual exploitation called Victim Focus, led the criticism on Twitter earlier today, after discovering new digital posters published on the force Facebook page. She tweeted: "I honestly have no other words for you today @NYorksPolice than what in fresh hell is this insulting, victim blaming garbage? Take this down!" In a matter of hours numerous other Twitter and Facebook users had joined the onslaught, calling the campaign 'outrageous' 'abhorrent' and 'repulsive'. The campaign posters have now been deleted from the force's social media pages and website and the force has issued a statement. 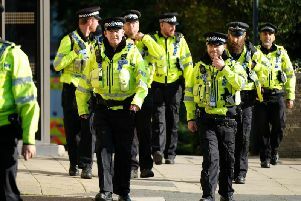 A spokeswoman for North Yorkshire Police said: “For this campaign, we were drawing on the experience of officers on the ground, that vulnerable young people who are at a cross-roads in their lives sometimes don’t feel that they have any power. No person should feel they have no way out of victimization. “This deliberately hard-hitting campaign was to get across the message that exploitation is not a life that anyone has to live, and that the police are there to support people who are at risk, and who need help. No victim of child sexual exploitation is to blame, and that is not the message we set out to give in our campaign. “We have received some positive responses to the campaign, but we have also received feedback from people who didn’t feel our message was clear. “It’s important to us that we listen to the public – and especially to the young people we’re trying to reach – so we’ve withdrawn the campaign on social media so we can do some more testing with our target audience”.